Our quality guidelines have been available in over ten languages for several years, so every SEO should know about Google’s German quality guidelines, our French quality guidelines, our Italian quality guidelines, our Japanese quality guidelines, our Spanish quality guidelines, our Dutch quality guidelines, our Russian quality guidelines, even our Polish quality guidelines. If you work at a large company that has doorway pages, keyword stuffing, or other tricks against our webmaster quality guidelines in a non-English language, consider this a courtesy notice that Google will paying a lot more attention to spam in other languages in 2006. Please check your site for issues now to avoid any potential problems. Please don’t misunderstand me as an American who has something against other countries. For example, I love France. I took French for two years in high school. I’ve been to France several times, and I’ve spent a lot of time in the Louvre staring at a beautiful painting of Madame Pasteur. I’ve done chats with French webmasters at Abondance. Heck, my registrar is French (Gandi.net). But we’re going to be stepping up our efforts in other languages, and I won’t shy away from calling out examples of (French, German, UK, whatever) sites that are removed for spam reasons. Search engine users in other countries and languages are just as tired of webspam as American users, and they deserve the best quality that Google can provide. P.S. If you want to see Madame Pasteur for yourself, the Web Gallery of Art has it. You can click on the image to see a larger version. Not surprising to hear that search engine spam is not just an American problem – nice example – and glad to hear you are turning the heat up on ’em Matt. It’s time, alek. I just don’t want people to misinterpret it as Google somehow being “anti-” any country. I cherish the cultures that could produce something as stunning as Renoir’s Young Woman Sewing. But if a French/Chinese/Swedish company is spamming, we’re going to start taking more action, and I think our worldwide users will appreciate that. Puny Human Alek’s alter-ego chiming in here. Give me a holler if big “G” needs some help SMASHING spammers. It’s all about the Inuit art, Matt (those dancing bears look cool). Sorry dude, but I’m just not feeling the paintings. Oh yeah – please finally start cleaning up our german index as well! I’m trying to reach positions in the jewelry sector with honest methods for years now (although my current domain is just nearly a year old because of a copyright problem with my old domain name), but I fail for most relevant keywords because of all the hundreds of ebay-agents and countless other affiliate-spammers that heavily misuse questionnable techniques! Thanks a lot Matt for raising a slight optimism that 2006 could finally become more successful for my ex-wife (who’s the actual goldsmith) than the past was! this is good news! Specialy in my region (dolomites), where people (and websites) are speaking italian AND german, doorway-and keyword stuffed domains has top-positions since years. This are not only private websites made by SEO`s, but also webistes of public held companies. I really hope that WH-work will be paid in 2006. This will be also specially appreciated by the users, specially tourists, who are googling for holiday destinations and offers. In my language, even the most ancient SEO-tricks work for ranking in Google. You don’t even need JS-redirects, just plain old invisible keyword stuffing. And exactly because it works fine, a lot of people earnestly still think that’s the way to go. The only thing I don’t understand: such primitive techniques like keyword stuffing should be easily discernible for the algorithm regardless of the language. So what kept Google from going after non-English spam before? It’s no surprise really with so many SEO forums and sites touting the use of doorways pages, cloaking and redirects. They all say the way they do it IS within Google’s guidelines and even Google themselves do it. Ok and what about rss hijacking and other rss based tricks ? So you accept his site has value? Just not that the doorway page does? Yet those keywords relate to his site (I assume so, my German is poor). If they were hidden in a meta keyword description tag you wouldn’t be complaining I guess, likewise if they’re embedded in graphic or some other hidden technique, or if they weren’t even on the page but in links to the page? All of which the user doesn’t see. Without those keywords, Google would only have link text and general corpus analysis to determine those keywords. Keywords you get from symantic corpus analysis aren’t on the page either! I guessed sf had a penalty (which I guess is similar to http://www.automobile-leasing.de/ one) because of the impossibly bad search results. So I’ve rolled English home page into root page so there’s no entry page. All the same keywords, all the same links, the only difference is now German’s, French and Spanish have to sit through the English page before being redirected. For what benefit? From my perspective, G has weaknesses in their algo, and instead of improving the algo they dish out penalties that overcompensate. So your department bans that site for having those keywords and you get all preachy. While another Google department is presumably trying to create those keywords by symantic corpus analysis to put them right back in! Matt, step back from your position and try to see it from his shoes! I think we all pretty much understand that second rate spam techniques will be caught and dealt with. Can we get back to finding out what spam techniques Google can’t detect? We definitely have a lot of keyword stuffed pages here. We’ve launched our own Nutch-based spider to bring back e-commerce-related data from the Web. It’s been quite a revelation. The sheer number of ways that sleazeball Webmasters js-redirect keyword-stuffed pages is stunning. Mind-boggling. And what these “geniuses” need to get is that, in the long run, they’ll do so much better by keeping it real and simply provide what people want… quality information. Matt, Google does an AMAZING job of keeping the “Information Highway” litter-free. If the average surfer had to walk that highway without you, she’d step in a big warm spam-turd every single step of the way. The Web would be unusable. Should I worry for my sites? No, I’m not that spamming. The problem over here ist that most people are not aware of anything about SEO. I remember last year I had been talking out on a meeting about my page showing of in some search engines (at that time I was not showing in google unless you were looking for the chamber of commerce – no kidding). The next day, a lot of people have been trying to look for my page using the URL in the search bar and seemed to acknowledge they could find me. There are either the people thinking Google is god and you are showing off from some divine activity or the people selling softwares (doorway) and saying it is the way to do it. Not to ask for too much, but I hope you guys also spend more time localizing other stuff well. It’s too bad Google doesn’t allow German users to use Google Video. It’s too bad the level of detail in Google Local is useless for us. Etc. Matt, you don’t have to be so touchy about going after non-US sites, whatever the language their presence affect the search results – it’s your core business they’re messing with. Do your thing. oh verdammt. ze caught my über-website. in german the posted content makes perfect sense. it’s the dialog between the ceo of a famous german car manufacturer and his 2 year old son. looking forward to ’06 and a cleaner german index – thumbs up! Since Black Hat SEO techniques on Hungarian (Czech, etc.) pages are not so widespread as in English or German for instance, your ranking algos optimized to fight against worthless web spam sites practically produce worse SERPs in many cases since virtually there is no SE spam out there, so many times quality content is penalized, banned instead of spam. “other languages” … “French, German, UK,” ?? Made me smile anyway, a good example of US centred world, we speak much the same language in England as you do in California. It was Winston Churchill that said we were two nations separated by a common language. I know what I am talking about. Last year, before I used to spend time on the SEO forums, i thought too that buying a software would be the solution. It was doing some kind of redirect but somehow it never worked well (the programm was an idiot telling me I would not optimize well if I was not optimizing my index page with title, description and keyword to 6 words at once). That’s why I started to look at the forum, because I lost money to such software in the first place! Now I am making my private crusade warning against these people. In the last 12 month I tried pretty everything I heard in the forum, never having an idea what was right or not. That’s why I say one cannot guarantee one will never get a penalty, let alone if google keeps an history. I think my sites are OK, if they are penalized for what I did in the past in the time I was copying every other site, half of the other are going to be away too. I have cleaned my sites since them and slowly cleaning the bad links (not to get a penalty). I am not a SEO, not even a web site designer, I just happened to believe what I had been told. Now I can say my sites are stables, not changed anything amymore for 6 month. There is a very spammy site trying to push me away of my 1st place in msn but I always come 1st again. On my local yahoo, I am 1st too. Hidden text and spam does not seem to be the answer. I just know why some people buy such program. They don’t even know about SEO or white hat SEO. I wished I heard about Matt one year ago. I’m glad for the comments. I won’t feel so bad about calling out spam in other languages now. Yeah I had to laugh at that “we speak the same language stuff”. But I just didn’t want to be the first…..
http://www.translatebritish.com wouldn’t be getting a ton of hits every day. Im not so sure they all speak English in the UK, head up to some parts of North Britian and I dont care how good you English is, you just will not understand what they are saying. A mixure of Cockney and Welsh with a couple of dark ales and I think Xhosa is easier to understand. And I am from a Commenwealth Country. In Italy you’ll do a great job. Now I understand because in the top resuls the 95% of sites are BH seo! DaveN is speaking English? NOW I get it! And the SEO’s (white hats of course) in other countries as well. Now I hope to never have to compete with spammy sites again. Every American I know that visited the UK for the first time told me the english were complaining they didn’t speak english…. 🙂 So I guess Matt is right,..
It’s true – there’s people in England that even I can’t understand. german, I get your point. Caveat emptor (“Buyer beware”) goes in any country I guess. But bottom line is you are responsible for your website – not somebody else. “…I do what I’m told” is somewhat of a smoking gun in this business. But – you don’t update your sites in months and that’s helping you in MSN? It’s my impression that the more you update and expand, the more the SE’s like you. Just what forums do you frequent? Let me suggest Webmasterworld and Searchenginewatch. Cre8site too if you have the time (which I unfortunately don’t…). MSN does not like updates on the index. Everytime I update the homepage, I loose the first place and come back when everything doesn’t change again( the day I changes my text based links to image based links because I didn’t want to see these words in the snippet, I went to the 9th place. After a while I came back 1st again – once I removed the keyword tag because the density was too high with having a part of my site made of graphics). I am adding pages but then the structure is not changing much anymore. MSN likes like yahoo RSS feed but the changes shouldn’t be too much on the page. At the moment I don’t have time to write much content but we update the internal pages (at least of the german version). I usually frequent SEOchat. I also read WMW but I am not posting there (I had been sent to WMW once I got hijacked and I found a lot of information there. I am still following the DC watchers. Here and now I frequent others forum but SEOchat –>Mattcutts–>WMW–>back to work is pretty much a routine now. I am only following english forums because I got the feeling, when something changes, it is first talked about there (and because the only time I went to a forum in my mother tongue, i had been a bit too loud with my anger at that time and been told to seek elsewhere). And no, I am not german native. I have never frequented german forums but I am optimizing for german keywords because I am in a german speaking country. I take the responsability for my website. I have been doing business before I made the website, I will still be there if I get a ban. I have regular clients. I had just some kind of period I wanted to try everything. Now I am not doing anything because I am happy to see myself1. on yahoo and msn (and 4 on local google). I have a business to run, no time to run after links and weary of making changes to my 300 pages website because it is the next hype and two month later no more. I am the Chong guy at the Pubcon’s conference in Las Vegas. I have several suggestions on improving the Chinese results (being a Chinese myself). Should I post the comments here or is there an email address to send the comments to? Chinese spammers are terrible… (i am ashamed to say it). I just thought something. You never looked at spam , duplicate content in ohter countries up to now? That is what you said. Up to now i thought the alog at your plex was doing that in every language. E.g. Keywordstuffing or duplicate content. What have they to do with languages? If i have duplicate content in english it is not hte same as duplicate content in german? So that answers my question on bigdaddy. Up tonow it is full with doorways, duplicate content and keyword stuffed pages – german results. Is there any hope for us german guys that the index will be fixed? I´d like to give you a search term with results where pages in without any use to the user!? This is good news. You are right spam in any language is just that – SPAM. And it needs to be taken care of. So (clap, clap, clap) good on ya Google. So are you telling us that you’ll actually start doing what you’re being paid for? You would have a point if the page were showing their keyword stuffed page to the users. They’re not. Showing the search engines 1 thing, and the user another is equivalent to a retail bait and switch. Page A should not rank high because page B has keywords on it. If Ford were awarded a car of the year award, and Toyota claimed in an ad that their car was car of the year.. you can bet toyota would be punished. The same is occuring here. The website is making claims that aren’t true about itself.., it’s using another website. I happen to work for an auto company, and we achieve very good search engine rankings without resorting to any of these tricks. What is your opinion of sites like this? They’re killing in google for any model and make of cars, because they repeat the same words in every listing for a used car. Would this be considered spam or is this completely ethical? Don’t click that link above. Not IMO. Why not simply put some text on the page, or create a HTML version and link to the page with Flash and images and block the spiders from the Flash page. Google warns against using images/Flash for indexable pages. Spam=spam and spam is NEVER justifiable. Like a baby, just as I’m sure they never lost sleep when they were putting the honest guys out of work by toping them in the SERPs with spam. Wow, Personally I am pretty shocked that foreign sites were getting some kind of preferential treatment before and were not getting evaluated the same way as US sites. It is about time then. Wow Matt, looks like you’ve stepped in a hornets nest this time LOL! It’s not like you’ve turned off their server, people can still access the site, it’s just not in Google. Somehow people don’t think Google is serious with the webmaster guidelines of “No Shirt, No Shoes, No Service”. Oh wah, grow up you stupid keyword stuffers and move on. I don’t have a problem with it at all. A site that’s that good won’t have to resort to tricks like that. It’s that simple. How about whether the poor people who may get laid off actually gave a damn about their end users? Clearly they don’t. For all the people to see! IncrediBILL, people will believe Google is serious about the ‘webmaster guidelines’ when Google starts actually factoring them in to the algorithm. Matt blogging about the occassional spammy site is a long way removed from enforcing AND rewarding based on the guidelines. The obvious solution would be to finally make the guidelines mean something POSITIVE. You’d see a whole lot of sites redesign themselves to the standard Google would like if there was something in it for them. Yes that’s mercenary, but there’s an awful lot in it for Google and sweet f.a. for anyone else. At the moment if you redesign your x year old site the only thing you’ll get from Google is an out-of-date listing for a while, and then eventually those wonderful supplemental results that pad the numbers beautifully but stopped existing way back when. I always told my customers to include a full blown site map, and for ecommerce customers that meant a complete list of expanded categories and products on a single page just to show google the entire topology early on and these customers tended to get more SERPs from the site map than from the dynamic catlalog and traffic soared. Not keyword stuffing at all, just exposing the entire site structire on a single page. Hey matt, question for you… I’m noticing Google has alot of open jobs. If I were interested in applying for one dealing with stuff similiar to what you do, what category would that fall under? While I don’t mind writing code all day, I’d love to find a job where I deal with more abstract problems that don’t require trivial coding. I get bored solving the same boring problems every day at work. Just wondering if you knew some cool jobs open that I could apply for. I personally don’t do the keyword stuffing / js menu / etc etc thing. Recently though, I did redo a site for a company who had the whole JS menu thing happening. The new site was launched about 3 weeks ago, which should be plenty of time for Google to take note of the nice clean xhtml-and-abides-by-their-guidelines site. don’t think that germany is the wild west from a seo perspective. there are a lot of good seo/sem people around. and they are all using the spam report frequently including myself. it takes quite a while but usually a reported site is removed within two month. I’m sorry, but I have to do this. It is nothing against you Matt personally, I am adressing Google! – The reinclusion request procedure tell us to act as a guilty person. You should know that it also may happen that there are mistakes in Google’s database (I have seen them). So if the want to be included, they should act like a guilty person that says “please reinclude me, I will never do it again”. You know that this is disgusting. This is a totalitarian act. – You are stating automobile.de as a bad example here. You may throw them out if you think it makes sense. But what gives you the right to stigmatize them as “guilty” or “bad”. It is not your job, only the judiciary is allowed to do that. They never violated any rights! Your webmaster guidelines are no laws at all, they are your personal rules. Don’t get me wrong: I am not working at automobile, I also think it’s okay to throw them out, it is just the way you behave. Google WAS a smart company, now you behave like an aggressive company. It would be great if Google would begin to think about there role. And it would be great if your users would look at what you do more precisely. Remeber Microsoft passport? People said that Microsoft can collect user profiles. They can sum up personal information with those data. The press said that you should close all accounts if you can’t be sure what’s happening with the data, also due to a security risk in 2003(http://www.pcworld.com/news/article/0,aid,63244,00.asp). I do not know why everybody trusts Google but distrusts Microsoft. I think this will change, especially with your behaviour. Just imagine: Microsoft would post a web site that they claim to be bad??? Guess what would happen? I myself do not trust Google anymore. Sorry, but this game is over. # Don’t load pages with irrelevant words. # Не загружайте страницы, содержащие слова, не относящиеся к теме. On a software site, I have an (automatically generated) list of supported hardware. There’s nothing else on this list, just – sorted and headlined by manufacturer – the model numbers. I guess there must be some 200 models on them. The rest of the page is pure content. So what about keyword stuffing in English, is that sorted out?? Try searching G.com for “spain birdwatching” and check out the page coming up @ no.2. – it’s a Spanish domain (view it cached and you’ll see G highlight the keywords easier!!). What the hell is this, still “getting through” the filters?? Please tighten it up Google peeps. Nothing personal Matt – thanks for spending time informing us through your blog. I think that page has passed the limits. There is no coherence in most of the text. Making a listing with keywords won´t help much, at least for a long time. Many of the webmaster guidelines tell webmasters what is factored into the algorithm. For example, here’s one: “Try to use text instead of images to display important names, content, or links. The Google crawler doesn’t recognize text contained in images.” For another example, “Make sure that your TITLE and ALT tags are descriptive and accurate.” Believe me, if your title is “untitled,” that’s factored into the algorithm. Then I realised he said “UK” – NOT England. There is one site, everybody knows it’s spamming but its creators are very close to SEO world and search engines, they promote google in many ways, and the site even proudly claims to be supported by Google France. I know some have done spam reports, but it’s still there. Could Google remove one of his close friends ? Hope you enjoyed your trip. I was wondering if I could ask you a question, the url ive added to the comment form, is over a year old now. I rank on several other engines apart from google. I was wondering if it has been penalized. I did send an email to google, but the reply back i got didnt tell me anything. I have done some dodgy stuff on the domain in the past, like search pages etc. , but it has been clean for months now. How do i get it back into google without the penalty. Sorry to have to post on your blog. Being that I only speak and write English in my Google preferences I request to only return English language queries, but this is definitely good that Google isn’t being bias and taking a interest to clean up all specctrums of the web. You would not believe how many times I have been arguing with Web site creators around here about good SEO practices – but they always pointed out that their research proved that Google did not care about spam in French so I was obviously wrong. I don’t mind competition when it is fair. With the playing field being levelled at last, the sites created by those of us who believe in ethical SEO may now have a fighting chance against the spammers. Would you mind if I quote you (in French of course) in an article about this Matt. Although I will be linking to this blog, many of my customers need a translation of this important message. Google s’efforce d’apporter des solutions évolutives et automatisées aux problèmes plutôt que de les traiter au cas par cas. Nous utilisons lesNe multipliez pas les termes sans rapport avec le contenu réel de votre site. Having worked at a search engine for years I don’t find what the German site did necessarily spamming. I haven’t looked at the situation in depth because I didn’t see a url. The simple reason for this is many web sites use a keyword intensive index page to reduce the number of pages within the actual sites. They are in effect reducing site size and spam at the same time. Only the other hand 99% of spammers rely on the volume of pages and numerous domains to exploit a search engine. This is especially true with “made for Adsense sites”. We maintain spam in most often exhibited by volume and repetition. A well-developed keyword intensive index page is not necessarily the mark of a spammer but the length of the page may be. It’s a matter of perspective and our philosophy was not to destroy businesses if at all possible. Larger search engines like Google often utilize very advanced automated features to attack spam. Each methodology has its benefits. Because of their mere size larger engines would have a higher ratio of casualties for innocent sites. That might be acceptable to you and them but not as acceptable to the real victim, his business, and family. That’s why we see spam more related to volume. There are hundreds of variables but the intent of sites can become rather obvious with the volume. Just because someone knows techniques for ranking well doesn’t mean the domain is breaking rules or spamming. Reading between the lines, it could be implied that the keyword stuffing / repeat word filter is based on a language pattern process that means it has not been so effecient in non-english languages. Matt, am I on the right track here? Obviously, a list of keywords is NOT useful in any way to a site visitor. They don’t gain any information by seeing mercedes bendz repeated 100 times on this page. The forums are buzzing with ticked off SEOs and webmasters. Im buying some Yahoo stock Tuesday morning. Keep it up Matt:-) Get all those hidden text people. Heck delete everyones website that has a meta tag! They are all SPAMMERS. It is when it is outside Google’s guidelines. Hidden text, keyword stuffing is for SE only and that alone puts in the ‘hmmmm’ basket. Well, that’s good. I’ve seen many spamming websites in simplified Chinese. Also, I also see a Hong Kong web design actively perform spamming for their own website and their clients. They use hidden links to links to all their clients, and also perform keyword stuffing. If you view the source code, you will know that. Even worse, they setup many duplicated websites with other domain names. For companies doing this, they just degrade the quality of google HK and google China. My recommendation is that: Fight against spamming sites but do not overdo it!! Otherwise, you may filter out some non-spamming sites as well. In case Google needs some outsiders who can understand Chinese to help them in fighting against spam, I can offer a hand. Show me one small business that is so negatively impacted by Google switching its algorithm that it can never recover, and I’ll show you a business that should never have been in existence in the first place because it put all of its eggs in one basket, and a basket that it subsequently relinquished control of. This is what I have a problem with. Do some businesses get hurt sometimes when Google changes algos? Yes, they do. Do they lose revenue and associated profits? Absolutely. Never rely on a supplier, trading partner, outsourced advertising company or agent, lead generation service, or customer for more than 25% of your business. Although Google doesn’t truly count as any of these, it does possess characteristics of all 5. One must also be mindful that spammers stop many legit businesses from ever getting off the ground. Also, let’s not forget that algo tweaks target spammers, not the good guys. For every legit site that sinks, 10 legit ones rise! In Sweden we suffer from SERP’s that are overfilled with spammy doorways and linkspam. The sooner this gets adressed the better. Wouldn’t be a good idea Google Brasil served results in, let’s say, Portuguese by default? I think you guys got a a basic problem here and sincerely after all I have written to Google and in this blog explaining the problem with no response whatsoever, all that is left now is to seek the government institutions in my own country to explain the problem (sincerely, this is not to harvest any answer from you guys, the bias here seems to be strong enough for me not to care about giving my time to suggest improvements anymore). Your brazilian webmaster help pages introduce the term SEO when the right version could be MOB (marketing e otimizacao para buscadores, or simply otimizacao para buscadores). Ok, Google introduce a term that people can not even pronounce in Portuguese, somethiong that people can not even relate to. People (not me, I have a languages background) start using it because Google uses it in their Brazilian webmaster pages. Then one day ‘SEO’ in Portuguese results only simply disappear from the second SERP onwards and all the results for SEO are in Irish Gaelic (!). Note: Adwords works fine though, it knows exactly what an elightened Brazilian citizen who can speak english wants by SEO, since all the ads are from companies offereing search engine optimisation. You go to the Irish Gaelic page of Google Ireland and the great majority of the results from the web for ‘SEO’ are in Japanese and other languages but Gaelic. Conclusion: Musical chairs meet searching on the web. Whatever the case is, local language first. I have never seen keyword stuffing specifically used in any Google guidelines. Can somebody point me to the exact Google url where they clearly use the term “keyword stuffing” and do they define it? What I have seen in the past is a reference to not load pages with irrelevant words. IMO if the words are relevant to the site and they aren’t used in close proximity repetitively (time after time) it may not constitute gaming. And still that is very subjective. Many smaller search engines do define these subjects in great detail, which I think is highly beneficial to webmasters. …..and IMO those that employ such tatics are try to ‘game’ the SEs. Best of luck with the cleanup Matt, No need for some of us to tremble though. Google’s competition can drive more qualified traffic in most instances. I’m saving bandwith and earning more per visitor. Thanks Google~! I was thinking about this spam issue on Google and throughout the Internet and it’s such a massive problem and yet elimination of it seems quite slow in comparison to the abuse. Has Google ever considered adding spam alert or spam form (the one that already exists) onto the toolbar. It would be so much easier and quicker to report spam. So basically when you have Google toolbar installed and you’re browsing the internet and come across an abusive website you could file a spam report from the toolbar. I’m sure that’s doable. Isn’t it? I have a large site with alot of independent subsections in different files about things to do with Spain in varios different languages. And I call the main page of each big section (in its own file) “index.htm”. So “property” has an index, “hotels in Spain” does too. But in the search results it looks like Google has indexed two pages (there is only one) and considers one (one ending in/) normal and the one ending in index.htm (the real one) as a supplementary page. So Google is indexing the “index.htm” page of each major section twice, even though there is just one page. And (this is what worries me), presumably, if Google is indexing 2 pages with the same content, even though just one exists, then in theory I could be suspected of duplicating content? Which would be disasterous because I’ve always followed Google guidelines so carefully. Thank you very much for your helpful answer Dave. It’s really useful and I will follow your advice straight away. >But I will investigate any scalable, robust way of decreasing spam. If that includes a “hall of shame” that shows that Google takes spam seriously, so be it. Does that include calling out SEOs? We had a lot of spam pages in Holland. But Google got ride of most. But, some pages still stay even after raporting them many times the last two years. Probably because the have links from DMOZ. I would welcome suggestions for sites wishing to cater to both US and UK English dialects. The intuitive “user friendly” approach would seem to be creation of a .com site using US English, and a .co.uk site with UK English, using the html ‘lang=”en-GB/US”‘ tag, as appropriate, to specify the dialect. With the November algorithm updates, this approach is clearly frowned upon – a significant duplicate content penalty seems to suppress .com en-US content. While I can understand the desire to rid search results of duplicate content, Google’s webmaster guidelines are currently mum on how to sensitively address international audiences all while avoiding (almost) duplicate content issues. Without resorting to slang extremes such as “Mi mate’s rucksack got nicked from the boot”, the two dialects are different – as searches for “my favourite colour” and “my favorite color” will attest (see http://www.antezeta.com/search-engines-site-localization-duplicate-content.html for more on this). For now, I’ve used a robots exclusion on my .co.uk domain to remove the source of offending duplicate content – but that hasn’t yet been sufficient to bring back my en-US domain from purgatory. I have seen spam, but this guy I think is the worse I’ve seen, and even worse to see him at avery SERP. Any chance Google will remove spamming sites from small countries or countries with a reduced number of websites? For instance, a couple of people I know have reported some websites to Google Spam Report, and in the last year or so, nothing has changed. We are trying to “keep it clean”, but some guys just don’t get it… they don’t follow the quidelines of “good behaviour”. What can we do? With Jagger 2 and 3 i was happy to see that some reported sites (in Dutch language) got banned within just a few days. Unfortunately, my happiness lasted only 3 weeks. All banned sites i was monitoring suddenly reappeared to the top positions in the indexes. Nothing was cleaned… the hidden texts, hidden links, cloaking… it was all still there on the pages and it’s still there today. I even see a search engine that publishes there SERP’s on static pages with keyword rich url’s. Can you imagine Yahoo! publishing their SERP’s on static/indexable pages ? I really hope Google will be more serious now. Go for it Matt, clean it all and make internet a better place for all of us. The sooner, the better. OK that’s clear example of spamming, but when Google will let us know about the problem when being banned. Well, my website is been banned for almost a year or maybe more and I still do not know the reason why is been banned from Google. I already asked from reinclussion 3 times with no result. I’ve changed my entire website more than 5 times and cleaned every thing up, but nothing. Well, I do not what is wrong with it. Maybe if Google could display a flag next to each serp for those sites who used black hat seo, maybe we would have less spam & stuff like that in the results. We need a cleaner web, because for now, it’s full of c**p.
You can download mac widgets and screensavers there. What can I do to make it appear in the Google results? I like spam http://en.wikipedia.org/wiki/Image:SpamInACan.jpg it is really tasty, but I dont like Spam into google. If google more pays attention now to Spam in other countries, find google Spam however or needs it assistance over the spamreport in the countries? I agree with cleaning the index. But I also think, it is wrong to pillory this company. I got a (german) marketing newsletter with this headline and I think, this is more than exclusion from a search engine index. It is hurtful also in the “offline world”. Denouncing the site is a sign of immature personality and bad business style. I totally agree that the links such as listed at the top should be banned – but I am also very surprised that these pages can be listed in ANY language, based on the quantity of the search words listed. This I thought would have been weeded out years ago using a simple algorythm comparing quantity of occurances of search words against quantity of other words. So each page checks if it is inside the frameset. Not even linking to another website may have to be a spam attempt. I can think of at least one scenario, in which such a redirect might be useful for a legitimate use. The Mercedes Benz Page above should be easily identifiable as a Spam Page – hence any page linking to it via a redirect should be regarded as suspicious, for example. It’s a tad sad that you even had to make that statement stressing that you weren’t attacking the other countries. Spam is spam wherever it is. Why not just say that your non-english spam filtering isn’t as good as the english one so you’re trying harder at it now? Hmm, yes many Americans get surprised when they find out that almost no English people speak like the queen 🙂 especially ‘up north’ (pronounced ‘oop noRRth’), or Scotland, where they have different words for a whole load of things. Hmm, I really think your presence in Singapore could be improved you know… it’s just ripe for a maps/local/transport/etc to be done. A whole country basically on an island. Would show you’re serious about Asia. Und hören Sie auf, so politisch korrekt zu sein. Im deutschen Internet sind wir viel boshafter. I tried to contact you but couldn’t find your e-mail address anywhere. I hope you’ll read this comment. Please allow me the opportunity to introduce myself. My name is Stefan Doerle and I am team leader for automobile.de, the site this thread is about. automobile.de is a well-known platform for new and used cars in Germany. We’re online since 1997. About 2.500 car dealers are customers of automobile.de. 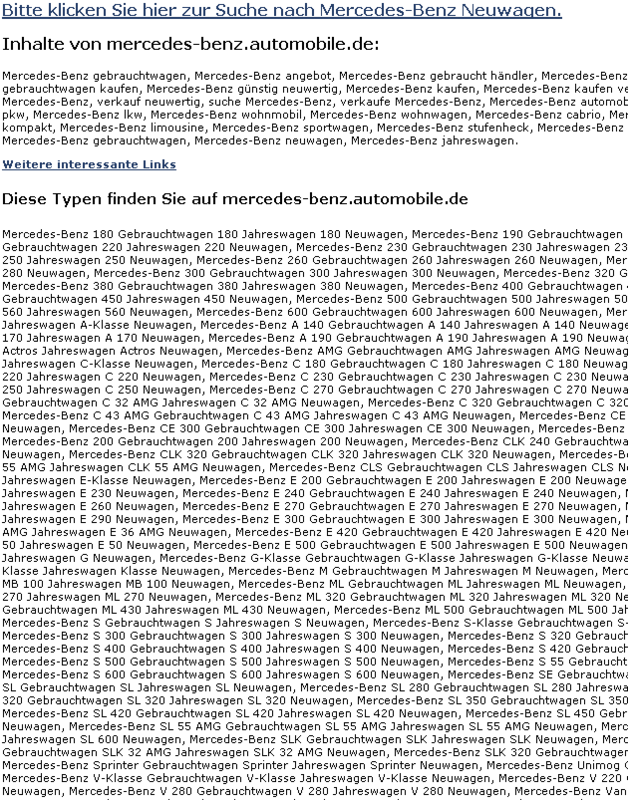 About 1000 dealers advertise their car offers on automobile.de. Private persons may offer their used cars for free. Now we removed all relevant pages and cleaned up the domain, as you can see. We’ll never use these techniques again. We’ll now create a sitemap to ease googlebot to spider our site. I have a technical question to you. automobile.de is working with frame techniques and we are not able to change this to a non-frame site in a few weeks. Therefore we must find a way for re-establish the frame context if a Google user clicks on our site in Google. It is specified at http://searchenginewatch.com/webmasters/article.php/2167901 how you can load the frameset by using java script. This site is recommended by the German Google helpdesk. May we use this technique to reload the frameset for single framesites listed in Google? Since we are a small company founding our business on this platform, it is very important for us and our customers to find our platform and car offers on Google. Because there are a lot of users who are searching for car offers, it would great for them to find our content on Google. So I ask you to support our reinclusion request. We submitted the request on 20th of January. Google just kicked BMW from the index and i think it would be a good idea to tell the community why this has happend. It seemed so as if BMW was trying to clean up it’s page, so I wonder why you did act so fast and rigorous. And another aspect could be of interest too. Why not spider twice a page for tricks like that? 1st attemp with the google bot known ident code and 2nd with another IP and ident code – may be a browser code, which would result in cheating on browser stats 🙁 – to get the same page and do a diff then. If the diff is below 5% page might be ok, otherwise there is something optimezed for the bot. Finally! Keep on doin’ it, every little spammer has to get kicked out of Google. The community is backing up! Matt Cutts hat es mittlerweile offiziell bestätigt: BMW ist aus dem Suchindex geflogen. „This week our webspam team continued ramping up our anti-spam efforts by removing bmw.de from our index, and ricoh.de will be removed soon for similar reasons”, schreibt der Google-Chefentwickler. Und dem Bürotechnikhersteller Ricoh passierte inzwischen tatsächlich das gleiche Schicksal wie dem deutschen Automobilkonzern. First of all, good to see you start paying more attention on other countries google indices. But I hope you don’t throw out the baby with the bathwater. Do you start to penalize pages which contain hidden content, or do you just penalize the hidden content as such (i.e. don’t index it, or give it a zero weight), and as such not relevant for searches ? there are perfect reasons for doing so. For example, I am using techniques like these to provide tooltips (layer is made to be visible on mouseover, otherwise it’s invisible). I would consider it OK if the text inside these layers would not be indexed, or given a zero weight (since it’s hidden by default and not visible at all to people without JS) – but I would consider it unfair if the entire page (including all visible content) gets penalized for it as well. Here is an annoying one owned by PetsMart. see anything special when hovering the links on the subdomain page? Duplicate pages at that. c’mon matt. get another big boy site. Even more, Internet users all over the world are tired (to be kind) of Web (in addition to e-mail) spam _from_ Americans – is it 80 or 90%? I am from Germany and have a good Photoshop Website. (Not commercial) It was always on number 5 to 6 on the first Googlepage in Germany. (I worked one Year hard for it) I have no Doorwaypages, no Spam, no other wrong things on my Website. I dont know, what I have done wrong exactly?? Since night of 18th January my Photoshop Website is totally out of Google Searchengine. Maybe wrong? Maybe someone was jealousi and reportet wrong? Please help me. What can I do? I want to work WITH Google, not against. What about Forbes.com and others like it? When you go to any of there stories linked to Google News you can’t see the news item the first time you go to the link… it’s a full page advertisement instead and not the expected news item. I’ve noticed if you click the “back” button you get to the actual news item. I’ve stopped looking at any of their stories due to this but it’s an annoyance having to screen your site for unwanted advertisers. I am from Germany and i have a question. Is it allowed to fill a ‘div-container’ with many Keywords inside and defined as non visible with CSS, like in http://www.agenturion.de? it seems that google is in the way to be a very much commercial company, without respect to individuals. you kick out of the index ? The hype of google for me is not more beliveable, ist only a lie. I think also about the Chinese Google. Nice to see the worry about google-bombing. When are you going to pull the bs for “failure” on your search engine? Perhaps BMWs exclusion from search results are Google’s first steps at censoring/indoctrinating Western Europe now that they’ve gained access to the Chinese market by similar means? Creeping Communism’s tenacious tentacles slithering slowly to totally usurp Europe’s collective conscious on open Internet interogation marketing methods? Seems google is a bit hypocritical about manipulating results. Searching on the word ‘failure’, in some instances, brings up President George W. Bush’s bio. I realize that google aligns itself with the Democratic Party, but manipulating search results like this seems just as bad as what bmw did. In fact, it may be worse since there are no facts to back up the search results. I have been reading this blog for sometime trying to learn how to build my pages right from the start so that google is satisfied, so that the pages are correct and so that people will come to my sites. I have well over 1,000 domains but have yet to activate more than 10 because I don’t want to piss off anyone at google. Now this BMW thing has really got me scared. Does google really provide serious SEO help for people? If so, I can’t find it anywhere. I want to do it exactly right and then leave it alone, I don’t want to reinvent the wheel or have to keep making changes to boost rankings. You’ll not also going to edit out the word ‘Freedom’ from our searches like you did for that big foreign language speaking country ‘China’ ? Are you? Google is a business and has a choice how to run it, if you don’t like it move on. Only with this attitude and feedback from users will google continue to lead the world as a search engine. Great Job eliminating the spammers, but when I do see a page loaded with search term’s I just pass it bye. I can’t image anyone with any kind of computing experience actually entering a site that has 20 terms lined up together and what your looking for in the middle somewhere. I can imagine within the first 20 results you should find what your looking for, or chances are it doesn’t exist. If you rank below that it could be crushing for your business. I do see why some may be angry about google stopping the spamming. Page Rank should solve some of these problems if enough people use it. Call me a cynic, but why now? Why after so many years is Google clamping down? Could it be as a result of Google´s recent drop in the stock market? Profit drop? Could it be that there will be a call from the Google ad sales dept. to BMW to “solve” the problem if BMW will only devote a few hundred thousand towards advertising on Google their listing on the Google search engine problem will be solved? Big Brother + Big Business = Bad news. Why do you delete the BMW.de results from your search results but you don’t delete the bogus results that come when searching on the word “failure”? I act as the marketing dept. for Sensaphonics Hearing Conservation Inc., a company that designs and manufactures custom earpiece products, primarily for musicians. a competitor, Ultimate Ears, has now posted a “resource guide” that turns up as a first-page result when searching Google for “Sensaphonics.” On that page, there is hijacked copy about our company and products, with the top header and bottom-page copy being specifically about Ultimate Ears products. The only links are to Sensaphonics main website. This “resource guide” is only viewable if found through their site map (not viewable through any regular site links), and lists similar false links for all competitors in our industry. It does not allow viewers who are searching specifically for Sensaphonics to reach our website. This “hijack” method is clearly unethical, and just as clearly outside the stated goals of the Google search engine. What can we do to put an end to this? As a very multi-cultural company in Europe,I can understand the negative reactions of some comments.On the other hand violating guidelines is now punished.SAying publically to some “big” companies they should may “seem” to be exagerated. Lets start to look at ourselves: you only drive at the allowed speed if there is a punishment behind. If there isn’t,then people(oh weak we are …) that push the limit ever further. I run multiple multilangual websites throughout Europe but they often aren’t listed on number 1(also on google.de).Reason is clear,but you can only hope that in cleaning up this mess,search results will become better. For Google this means business. Try as a UK customer to find a product for Uk. The only way around is as a company to place paid ads. Google makes a BIG mistake with trying to give local content. Europe is unified and even a company from outside is able to deliver to UK customers. Google should think of incorporating other companies from outside the UK to have a listing on UK results.A “simple” way is to ask companies who deliver to the UK(or another country) is to place a simple marking code on their company I.D. page. NO company would dare to try to violate this guideline…. ebay was for me the reason why I didn’t use Google any more! All the fake pages that were found for any product search are really annoying. I have a question…I myself am a webmaster, though kindda’ young, and I have some 2-3 online stores in Romania (I won’t state here their URL’s). My question is this: suppose I have bits & parts of info (for example: a printer’s description) that are on more than one website, because both websites mention this printer / product: is this considered as sp@m? I just found out that this Romanian online store http://www.insoft.ro was banned from google(one reason being the duplicate content on the same website), and I am more careful with the content of my websites, but…what about this? Also: how much of the advertisment on other websites is considered as sp@m? Is there a … boundary or smth like that? I hope I am not too…naive & boring in my questions, yet I woudl surely appreciate an answer. I am coming across more spam sites these days than ever before in google search ! I have reported several times using the google spam report system, there is no action taken. Most of these spam are cloaked pages. Please look at this one The site provides different domian names each time like http://ultimate-tanning-product.bravedog.org/. Would like to know what measures Google Engineers are taking to diminish cloaked sites ! It’d be rather nice if there was a compliance checking page on Google where we could ask the spider to check a page. I use standards checking pages to verify my xhtml, my css, and my rss. It’d be nice if it’d be that easy to rate a page for SEO. I think keeping the innerworkings so secret is a mistake because it forces web designers to guess at what is a legit method and what isn’t and that prompts them to hire so called SEO experts that are as often as not crooks. For example, if I make the site auo-select the right language version for the user Google might see a different site than the user. I assume that is okay but I can see how it could be abused. Jobverbund.de is one of the biggest spamsites in germany with more than 1,5 million site:-search results. most of the results are doorwaypages, which leads to the mainsite or to completly other homepages. it would really be nice and fair if someone could check and stop this spamming. uups, on my further posting i forgot a test-searchstring. ..is this site also for german sites or only US? Yes, Google gets spammed but using ‘intelligent search terms’ usually gets me what I want in the first 6 or 7 pages. However, what really worries me is that Google is policeman, judge, jury and executioner. I know you are ‘only’ a search engine, but appearing on your pages is the difference between life and death (or solvency and bankruptcy) for many small businesses. Mistakes happen, domains are ‘suspended’ due to competitors complaining of gateway sites, or just by accident……. I am coming across more spam sites these days than ever before in google search. That I have reported several times using the google spam report system, there is no action taken. It is really a problem that pages like jobverbund are spamming google. I wonder why nobody reacts. BMWs Doorwaypages are kicked within days. Hi matt, It seems that the new algo or data refresh w/filters did a great job in eliminating spammy sites (june 27 cleaning). But lets say that this new technique inflicted ‘collateral damage’ as well. Our site lost 70% of its traffic for no good reason: Its in Spanish, its not spam, it is original content and valuable for our users, we don’t do any dubious linking, no duplication, no doorway nothing, just pure & decent white hat stuff. Any idea if this will be fixed? Yet I know the problem of which is spoken of. I come from the sun and need Markisen or Plissees for my Sonnenschutz project. Then I coming across more spam sites these days than ever before in google search. That I have reported several times using the google spam report system, there is no action taken. I totally agree with you and I would appreciate some cleaner google-result-pages. When it comes to sites of some bigger-companies like ebay I am wondering what is legal and what is not. I have found the pages like http://keyword-index.ebay.de/a-1.html . There are no hidden clouds of words and other stuff, but it is likely to a page full of keywords. Is this eba-page legal or are there different spam-rules for global-players and small companies ? We do that by improving our algorithms the vast majority of the time. But I will investigate any scalable, robust way of decreasing spam. If that includes a “hall of shame” that shows that Google takes spam seriously, so be it. As I’ve said, our guidelines are quite clear. working in a small company like our, it will take hours of hours of time to understand the realy complex way how to get a better listing in Google. Other companies have a much huger budget to do this. So – it would be greate if search machines like Google do really support small companies to become bigger. Do you have any advises for us. waht should i do when i have a site with differnt langues? Someone told me that i have to sqare the Site in different domains? The exploitation of search engines today is a serious issue. What are other Latest Search Engine Spam Techniques? I refuse payments with Google until they act consequently on bigger firms than on other (small) firms. This is also clearly stated on Google guidelines.I suppose these companies pay a lot on (Google)ads,so Google can’t shoot in his own feet,can’t they? I´ve checked your results / serps and in the meanwhile there are 29.500 instead of 10.000 of DWP. What is Google doing against this kind of BlackHat-SEO? Especially the german filters should be readjusted with the next update i think. Can u suggest any option for seo in marathi language. Is this black hat? Haha, that’s too stupid! i like to see that big sites like automobile.de get banned and are treated like any other. Unglaublich…, wie kann man die Nerven haben im Blog von Matt Cutts mit der in Deutschland am meist umkämpftesten Keywordkombi zu posten? I think it’s a good thing that you are trying to get rid of duplicate content but at the same time it also worries me. Some of our clients over the years have bought several domainnames with the country extension in the domainname itself because the TLD’s were in use by cybersquatters or were just too expensive to purchase… One of our clients is targetting different countries with their products and information. It varies from country to country but not much… maybe 5-10%. There are the same languages such as english (us, uk, india, …) in a lot of places or as mentioned before dutch in holland and belgium. It is a medium sized company and had no means to go and host the site locally in each country, neither are the TLD’s available… is it not possible to allow for some call it meta tag that clearly specifies the market.. such as india or uk, or holland or belgium… In that way my customer would already restrict a part of the world from finding that website via google, right? He has no problem with that…. If the tag would consists of two parts: company name and target audience (location) … that way the google algorhythms should be smart enough to figure it out? I really hope to hear back about this because I’m getting seriously concerned. Dear Matt, Thank you for posting my question on your blog. I am currently implementing the following for my client. I hope this will google will not see it as duplicate content. Could you enlighten us on if this would be a good thing to do? It seems that my code was cut from the post so I’ll try and rephrase. 1) geo.region = uk or za or us respectively. I needn’t worry about spam anymore. i’m using tool, that doesn’t allow users which spamed in before to write a coment. that works with an IP adresse blacklist. I think it a private owned company, but really, guys, i can not understand how they will write so much spam? Everybody will understand, that this is spam and will delete that. Another good example of primitive seo mistake spam in other languages ist http://www.pcschiedel.de/. You can find hidden links to doorwaypages at the bottom of the page ;-). How does it come that Google doesn’t react? Well on one side most Domains start to devolop their popularity by getting as much cataloques as possible. After 1-4 Weeks You are having produced an own SPAM net. For example if I enter COPYSHOP and the first 10 RESULTS are Catalogues (Name address small discription), I as a user after five results I give up. That is not what I want to find. And Your domain sometimes apears in hundrets of results! I made the same expierience! it is an old post, but i must say, that i be the same meaning as the meaning like achim´s. Much people post her mailadresses in webcataloges to get some backlinks and than they where wonderet about the much SPAM. Yes, many webmasters do there Websites post in Webcatalogs, but how do you get your visitors??? I Agree with Matt. I know that german webmaster try the keywordstuffing.. A lot of webmasters ! Why? Why spend money in a project and be kicked from google in 6 month ? I was reading your post and have a question related to this topic, but didn’t seen it answered here. Is there any SEO benefit for sites needing to be indexed in multiple languages to purchase domains for .eu, .de, .fr, .it etc and redirect all to the .com page, or to post language versions of the site on these domains? (Or would it have the same effect to post the language versions on the main .com site, which is what I thought is the case)? This is good news. You are right spam in any language is just that. Google will increasingly improve the spam so hopefully the past belongs. Wow, I didn’t know about this case. But it’s good to see that even the biggest websites will be get an penalty when using spam methods. I always thougt that there will be other rules than for standard small websites. But how about the behavior of social bookmarking services like mister-wong.de and others… They also use massive keyword-spamming to be ranked in nice positions. I guess social bookmarking actually brings the biggest share of spamming. However, since I have not the time do it self and not the money to pay some one I do prefer less frequent optimization like linking several urls to one and than this to the main content. Thank to Matt for the forum. What if my site is both in German and English… but domain name is mysite.com… will advertising in german sites will give me any SEO value?